Carpenter ants get their name because they usually hollow out wood to make a nest cavity. Outdoors: The parent colony, where the queen, eggs and young are located, is usually outside and can often be found in stumps, logs, old firewood, and especially in dead portions of standing trees. Indoors: Nests are usually located in decaying wood and then expand into sound wood, but can also be found in small voids. Colonies usually contain about 3,000 workers (up to 10,000-15,000 including satellite nests) when maturity is reached in about three to six years. There is usually only one functional, wingless queen per colony. Carpenter ants are wood-destroying organisms and can compromise structural timbers. In addition, worker ants are nuisance pests that are large and easily noticed, especially in the winter. Black, combinations of red and black, or completely red. The only external indication of an infestation other than the presence of workers and/or swarmers is the appearance of small piles of “sawdust” and debris expelled from the nest. Black, combinations of red and black, or completely red or brown, depending on species. 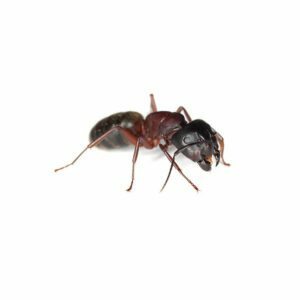 Workers vary in size (1/8-1/2 of an inch or 3.5-13 millimeters); queens measure about ½-5/8 of an inch (13-17 millimeters). Throughout most of the United States. Insect honeydew, plant and fruit juices, insects, and other arthropods. Indoors, they will also feed on sweets and desserts, eggs, meats and grease. Swarmers are not produced until the colony is more than two years old. Swarmers appear from May to August in the East and February to June in the West. Developmental time (egg to adult) is six to 12 weeks. Relatively easy to control, especially if colony is located.